The new nasal flu vaccine has already been shelved in the US. Celeste McGovern investigates live viruses, MSG, narcolepsy and other reasons why you should be wary…. Flu vaccination season began this autumn and is still in full swing. Medical practices even close on selected days so that the only patients are there to get their vaccines. Public-health information packets are sent out to parents, while legions of nurses descend on nurseries and schools, where children line up for the flu ‘jab’—in fact, a squirt up the nose. Public-health officials and doctors’ offices are promoting the nasal flu vaccine, called Fluenz Tetra, as the first choice for all children aged between two and 17 years. 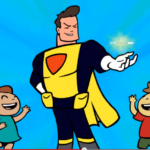 One National Health Service (NHS) trust has even produced a ‘Flu Hero’ cartoon for children, featuring a little boy who gets a nasal flu vaccine from a superhero and, like the bite of a radioactive spider, is himself transformed into a superhero with super defenses. Still, flu vaccines are notoriously hit and miss—the 2015 influenza vaccine was widely panned for being only 23 per cent effective. Flu viruses change every year and health officials admit that each year’s vaccines are designed to target the ‘best-guess’ four of the dozens of strains of flu viruses that float about during every flu season. 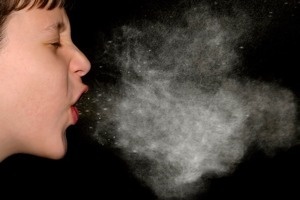 Even when there is a good match between the strains targeted by the vaccine and those that are circulating, the CDC admits that vaccines are typically only 50–60 per cent effective.3 But while we know the nasal flu vaccine doesn’t work, are there also reasons to question its safety? Public-health officials dismiss the idea that you can get flu from the flu vaccine as ‘myth’. Yet it’s little wonder that there’s such a myth though, as the side-effects of the vaccine are identical to the symptoms of flu: a runny or stuffy nose, headaches and muscle aches, sore throat, loss of appetite, chills and fever and earache. It’s not influenza, we’re assured, it just feels like it. The nasal vaccine contains live viruses, but its promotional material says they are “attenuated”—disabled and harmless in themselves, but still able to stimulate our immune system to fight off the flu bug when it’s encountered. According to the UK’s electronic Medicines Compendium, each vial of Fluenz Tetra vaccine spray contains 107—that’s 10 million—live attenuated and “genetically modified organisms” of each of the four strains per nostril. That’s 80 million viruses (give or take a few million) per dose specially designed to grow and replicate inside the nasal passages. The vaccine’s engineered viruses include H1N1 (swine flu), which is dangerous because it can lead to encephalitis, or swelling of the brain, that, while rare, can lead to disability or even kill, just like the rare worst-case flu. It can also cross the blood–brain barrier and lead to long-term brain inflammation. Because viruses mutate just like the bacteria that develop antibiotic resistance, there is no assurance that these viruses will not revert to the infectious wild-type virus—or something even more virulent. This risk of live virus transmission is why government pamphlets warn that “children who have been vaccinated should avoid close contact with people with severely weakened immune systems for around two weeks after being vaccinated”, while vaccine experts have warned that children “may have to stay away from elderly relatives for a few days after vaccination”. Nevertheless, the UK’s NHS Choices website has pitched the vaccine as an agent to protect the elderly and sick. It even claims it could prevent 2,000 deaths this way. Some religious groups have objected to the nasal flu vaccine on the grounds that it contains pork gelatine. The NHS concedes that it does and suggests getting an injection instead to avoid the animal ingredients. But pork is just one of the many “excipient” ingredients in the nasal flu vaccine. Top of that list is monosodium glutamate (MSG), a chemical that many parents try to keep their children from consuming. Neurosurgeon Russell Blaylock’s book, Excitotoxins: The Taste That Kills (Health Press, 1996), explains how scientists have known for decades that MSG can literally excite brain cells to death (hence the name ‘excitotoxins’), and also cause the sort of sustained brain inflammation common to neurological diseases like autism, Alzheimer’s, multiple sclerosis and Parkinson’s. He also documents how it’s particularly damaging to developing brains, which is why MSG is banned from baby foods. AUTOIMMUNITY, CELESTE McGOVERN, DRUGS, VACCINES autoimmunity, Fluenz. brain inflammation, inflammation, MSG, nasal flu, toxins, vaccine contamination. permalink.